Sparrows Group has been awarded a contract to fully refurbish two offshore cranes for Centrica in the East Irish Sea. The 27-year-old cranes are sited on the Morecambe field’s DP6 and DP8 platforms off the coast of Lancashire and Cumbria. Centrica has announced it is set to invest up to GBP 60 million to completely refurbish both platforms and boost overall production at Morecambe Bay. Crossing a range of engineering disciplines, the project work includes the complete removal of each crane from the platforms and their transfer onshore for full refurbishment before reinstallation. “The work involved in this project is core to what we do and utilises the in-house skills we have over several engineering departments. We have had a strong start to 2017, winning work and achieving success in new markets and this contract ensures a steady stream of activity to keep our workshops busy over the coming months,” adds Mitchell. 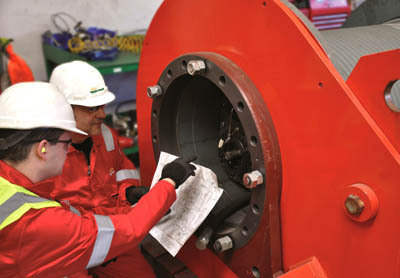 The workscope involves several engineering disciplines including mechanical, hydraulic, electrical, structural, and automation and control which are all essential to ensure the delivery of reliable safety critical equipment. All components and machinery will be refurbished, repaired, upgraded or replaced, with inspection, testing and recertification performed to ensure compliance with safety standards. The Morecambe Bay gas fields are among the biggest in UK waters.